Deciding on suitable eyewear for you is an important decision that requires personal attention from an eyewear professional. 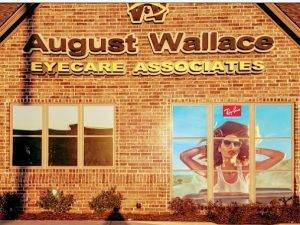 At August Wallace Eyecare Associates we offer the kind of personal help that makes us stand out from the rest! We can help you with the process of choosing from among many kinds of high-quality eyewear styles to get the appropriate look for your face shape and lifestyle. We offer classy and designer styles that fit progressives too! Our trained Longview eye care staff is here to assist you to find the best fit for your specific needs and explain how different lenses and frames will affect your vision. They will help guide you so you can find the proper look, fit and functionality you want from your eyewear. Looking for eyeglasses near you? We offer a great selection of high-quality eyeglasses, contact lenses, designer frames, and sunglasses. We carry all kinds of eyewear - from casual, economical, backups, designer brands, and basically anything you'd need for your whole family, from new pairs, prescription sunglasses, to backups. Stop in to our family oriented office - new clients and all our current patients are welcome to visit us with their current prescription - no appointment necessary. If you're coming from Hallsville and Gilmer, our office is just minutes away. Eyeglasses are popular today - with so many frame styles and materials available as well as safety glasses and lots of options for kids frames. Sports glasses, computer glasses, protective eyewear, driving glasses... we can help you with glasses for your specific needs. Transitions lenses - photochromic lens technology—the ability of a lens to darken in the presence of invisible UV light - are the #1 brand of photochromic lenses recommended by eye care professionals worldwide. We don't rely on hand-measurements anymore. Get the best fitted glasses with our M'eye Fit Mirror for a personal touch that's precise!